A train from London Marylebone to Oxford Parkway negotiates the new Gavray junction which enables trains to run between Oxford and Marylebone for the first time. Construction of high fencing to reduce noise can be seen. The Chiltern Railways Evergreen 3 Project, which will establish the first new intercity mainline rail link since the close of the Victorian era, is now very nearly complete. The project has entailed upgrading large stretches of track and building a new chord linking the Oxford to Bicester line with the mainline between London Marylebone and Birmingham Snow Hill. 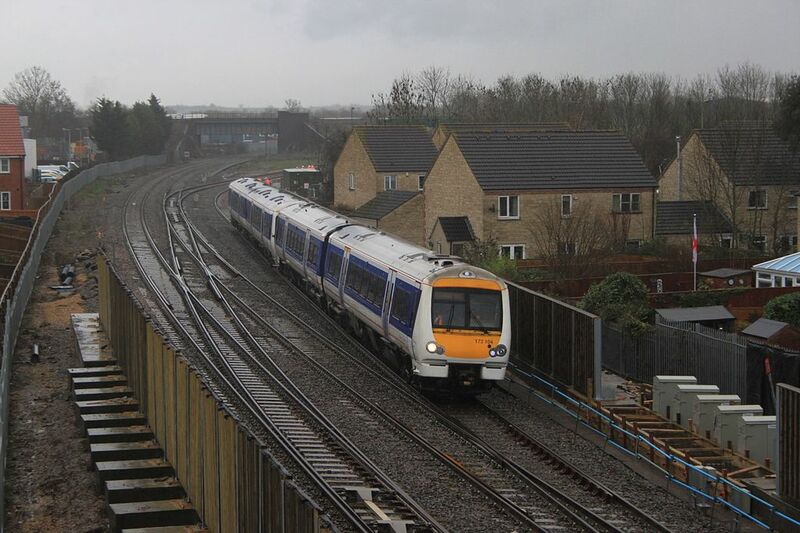 On 26 October 2015 services commenced between a new Oxford Parkway station, situated four miles from the centre of Oxford at Water Eaton, and London Marylebone. The final link between the main Oxford station and Oxford Parkway is due to open in Spring 2016; this again entails replacing existing track and carrying out other major infrastructure improvements. Moreover, the scheme represents the first link in the East-West Rail project the ultimate aim of which is to reinstate the Varsity Line between Oxford and Cambridge. By modern standards the project is ambitious, although it has not entailed building much line on virgin territory. In this respect it is not on the scale of its Victorian counterparts or the current HS2 project. Nevertheless, the promoters are perfectly correct to bill it as the first new intercity route since the opening of the Great Central in 1899. In fact, many of the objections raised by individuals and businesses residing along the route would have been very familiar to Victorian railway promoters; a case in point concerns noise and the impact of more rapid and frequent train movements on livestock. As noted above, the new route currently terminates short of Oxford at a new ‘Oxford Parkway’ Station. Major track and infrastructure improvements must now be carried out on this final short section of the new link. The Varsity Line between Oxford and Cambridge was severed in 1967; although it is surprising to note that Beeching’s axe was not actually to blame on this occasion. Since then residents in the suburbs of Oxford lying along the route have become accustomed to no more rail traffic than an infrequent and slow local train to Bicester. The opening of the route between the centre of Oxford and Marylebone will increase this to 74 train movements each day. When the next stage of the East-West Rail Link is completed in 2019, which would enable trains to run as far as Bedford, Rail 784 reports that this will rise to 171 train movements. Thus, it is not surprising that concerns were expressed regarding increased noise and vibration associated with the new rail services. The project has been authorized by way of a ministerial order made under the Transport and Works Act 1992: see The Chiltern Railways (Bicester to Oxford Improvements) Order 2012 SI 2012/2679. The ministerial decision letter of 17 October 2012 which accompanied the Order added certain conditions to the deemed planning consent granted by the Order. Condition 19 requires noise and vibration mitigation measures to be adopted along the entire route insofar as this is reasonably practicable and necessary. As regards the final section between the main Oxford station and Oxford Parkway, Oxford City Council must satisfy itself that the promoters’ plans satisfy this requirement before approving the works. Network Rail (which is now the lead promoter having taken over from Chiltern Railways) submitted its noise mitigation proposals to the Council’s Planning Committee in early December following a public consultation demanded by condition 19. The noise mitigation measures mainly consist of the erection of 2.5m high fencing where the tracks run past housing. Having undertaken much research Network Rail maintain that the vibration will not be sufficient to merit additional measures. Modern track technology and trains means that vibration is now far less of an issue than it once was. Nevertheless, the proposals may not be enough to assuage public concerns regarding the impact of the scheme on residents along the route. The proposals have already generated a large number of comments, many of which challenge the assertion that a 2.5m fence will be sufficient. Alternative suggestions include higher fencing, speed restrictions and even the use of Tata ‘silent track.’ Further along the line towards Bicester, on the section that is already open, the proprietors of Wendlebury Gate Stables have fought a long battle with the promoters of the scheme regarding the adequacy of noise abatement measures where the line runs alongside their riding school. They argue that the noise problem is especially acute at that location because it makes it difficult for riding instructors to make themselves heard during lessons and because of the susceptibility of horses to noise and sudden movements. These arguments were forcefully made during the public inquiry into the scheme which was held pursuant to procedures under the Transport and Works Act: see document OBJ/238/8. The Secretary of State agreed that noise mitigation must be undertaken at that location and Wendlebury Stables are specifically mentioned in condition 19. Nevertheless, arguments continued regarding the adequacy of the proposed fencing. From the above it is clear that, although noise features prominently in the planning process and a myriad of detailed consultants reports have been produced, there can be no guarantee that the noise issue will be resolved to the satisfaction of all affected parties. This begs the question of whether any legal avenues may remain open once all planning consents have been granted and the line is in full scale operation. Anyone contemplating an action in public or private nuisance with a view to gaining an injunction or damages, once the line is in full scale operation, would immediately run into the statutory authority defence. In short, railway operators are immune from liability in nuisance in respect of harms which are the inevitable consequence of exercising their statutory powers and duties. This was established by the very early railway case of R v Pease (1832) 4 B & Ad 30, 110 ER 366 which concerned the spooking of horses on the Yarm turnpike by steam engines grinding along the Stockton and Darlington Railway. The solicitor to the Stockton and Darlington Railway, Francis Mewburn, had had the foresight to insert a provision into the private Bill under which the scheme was authorized which specifically enabled the railway company to use steam locomotion. The Court of Kings Bench held that Parliament must have foreseen that travellers on the turnpike would be incommoded by the locomotives and deemed this to be a reasonable price to pay for the benefits of the technology. The importance of Mewburn’s clause was immediately apparent and brought about the adoption of section 86 of the Railway Clauses (Consolidation) Act 1848 which sought to standardise clauses used in the dozens of private Bills which came before Parliament at the height of the railway revolution. Section 86 established a defence of statutory authority and played a significant role in limiting the liability of railway companies for fires caused by stray sparks and burning embers emitted by steam locomotives. The case law did, however, bring about one important qualification in that the defendant would have to show that the harm was the inevitable result of exercising the statutory power. This led to very lengthy and technical arguments about whether the railway companies has used the most appropriate technological means of reducing the emission of sparks. Given that the railway companies monopolised large proportion of the railway engineering expertise. It was very difficult for plaintiffs to challenge their assertions regarding what constituted the appropriate engineering solution. As regards 21st century projects it is interesting to note that the HS2 Bill expressly incorporates section 86 of the Railway Clauses (Consolidation) Act 1848. More generally, section 122 of the Railways Act 1993 established a defence of statutory authority in respect of nuisances caused by trains operating on the national rail network. Given that the Evergreen 3 project forms part of the national rail network the fact that section 122 will come into play is beyond doubt. The courts have never had the opportunity to fully consider the scope of this section but it seems likely that it comes equipped with existing common law baggage. In this respect it may leave open the possibility of arguing that the harm was not inevitable. However, as regards Evergreen 3 and the completion of the Oxford to Oxford Parkway section, by the time that Oxford City Council gives its assent to the noise mitigation plans demanded by condition 19, the suitability of the proposed measures will have been very thoroughly investigated. A litigant would face an uphill struggle in terms of persuading the courts that the planning process had got it wrong. Added to which is the fact that any modern interpretation of the statutory defence is likely to incorporate cost considerations. Until a new line is put into full scale operation one cannot ascertain whether all adverse consequences have been foreseen by the planning process. If one views the common law as a means of fine-tuning the planning process rather than as a mechanism for correcting ‘regulatory failure’, it is possible that the courts would be more receptive to augments that a nuisance at a particular location is not inevitable. As regards Evergreen 3 and the final link to Oxford centre, it is notable that Network Rail has already considered the judicious use of Tata silent track at locations particularly susceptible to nose such as Wolvercote Junction (see Oxford Mail). It is not beyond the realms of possibility that a court could be persuaded that more use should have been made of this system if the noise is worse and more widespread than originally contemplated when the line is put into operation. Having said that, it is one thing to install special track at the construction stage, it would be quite another to rip up new track and install it after litigation. In such circumstances it is still likely that cost would rear its ugly head as a decisive factor. There may be more scope for challenging the use made of less sophisticated noise abatement measures such as the height of fencing at riding schools.